On the heels of three Russell Wilson touchdowns, the Seattle Seahawks utilized 17 unanswered points in the second half to drive past the San Francisco 49ers on Sunday afternoon, 24-13. The final score may not be as indicative as you might think as it took 59:59 minutes of game time for the 49ers to get their only touchdown. Wilson connected on his first touchdown toss of the game, a 17-yarder to TE Nick Vannett with 6:33 left in the third and then on the opening play of the fourth quarter, Wilson hit his other tight end Jimmy Graham on a 1-yard score to push the lead to 21-6. That would be more than enough for Seattle. Wilson finished the game completing 20-of-34 passes for 228 yards and the two aforementioned touchdowns to go along with an interception to safety Eric Reid. He chipped in with 22 yards rushing as well as a score on the ground just a minute and a half into the game while RB Eddie Lacy finished the game with 46 rushing yards on 17 carries. Rookie QB C.J. Beathard threw for 201 yards for San Francisco on 22-of-38 passing, but the shift to former New England Patriots QB Jimmy Garoppolo may have finally happened as Garoppolo came in for an injured Beathard on the final drive, and hit WR Louis Murphy for the 49ers lone touchdown. Garoppolo connected on his two pass attempts for 19 yards and the score in his first action with his new team. With that, we give you our PFF-exclusive takeaways from the contest for each team. Ifedi had one of the best games of his young career, where he has often struggled in pass protection. On 43 snaps in pass protection, Ifedi allowed only one pressure, finishing with an 83.3 pass protection grade. If the Seahawks can see improvement in Ifedi’s pass protection, it would be a huge hep to Russell Wilson who is in the top five of most pressured quarterbacks this season. 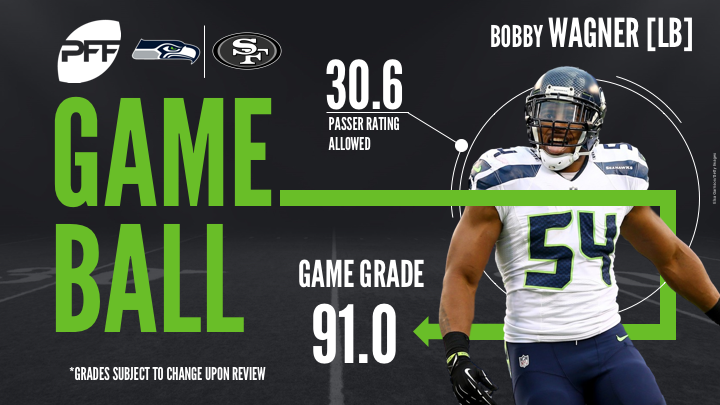 The Seahawks linebacker had another outstanding game, notching another in his string of impressive performances to date. Wagner was excellent in coverage as he was thrown at six times, surrendering four catches for only 11 yards to go with an interception. C.J. Beathard had a passer rating of 30.6 when throwing his way, which led to a coverage grade of 92.0. Adding to his versatility, he recorded three stops in the run game and two quarterback pressures. After acquiring him earlier in the season via trade, Sheldon Richardson has been everything the Seahawks hoped they were getting these past two weeks. He was disruptive defending the run, recording a grade of 89.5 in that department and has 12 total stops over the past two weeks. Richardson has also been effective rushing the passer from his interior position, notching five total pressures over the last two games. In a game where the 49ers offense struggled to get anything going and sustain drives, Marquise Goodwin was one of the few that stood out against a stingy defense in Seattle. He was targeted six times, catching four of them for 78 yards. Goodwin has had an up and down season, having been targeted 58 times and catching 27 of them, he is on pace to eclipse his previous career-high of 29 receptions within the next few weeks. As the Jimmy Garoppolo era nears closer for San Fransisco, current starter C.J. Beathard played a relatively efficient game going against a defense that is superior in most areas matching up. He was under pressure often, going 8-of-17 for only 63 yards opposed to 14-of-21 for 138 yards when given time in the pocket. Facing an elite front seven, the 49ers struggled in protection as Beathard was hurried on 16 occassioins and hit six times. Reid opened up his day by intercepting Russell Wilson’s pass on the first play from scrimmage. Although he had a bad penalty and did not grade great in run defense, his coverage was outstanding. On 40 plays in coverage, he was targeted five times allowing two receptions for only 15 yards. He finished with a coverage grade of 92.5.